Dubai: A horrific traffic accident on Sunday caused the death of a passenger and left two others with injuries, according to Dubai Police. 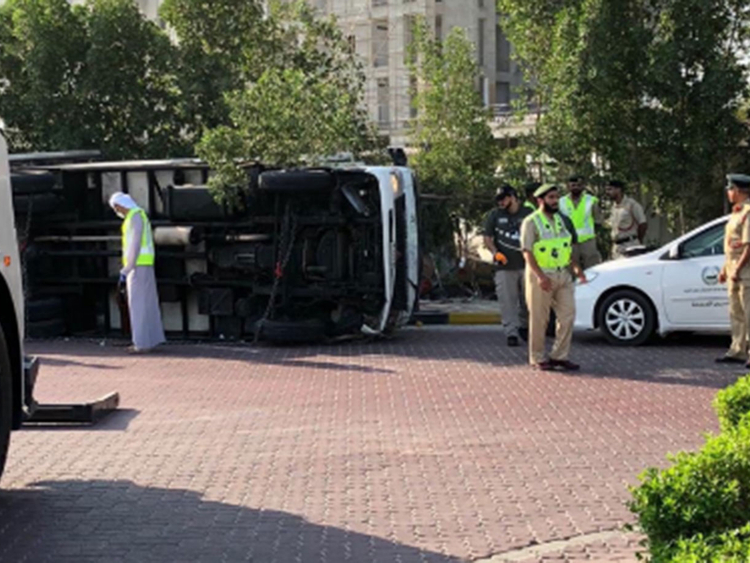 The accident happened on the Palm Jumeirah on Sunday early morning, after the truck driver lost control of the vehicle. “The driver lost control due to the excessive amount of goods it was carrying. This caused the vehicle to steer off the road when entering the roundabout,” said Dubai Police. One passenger was killed at the scene, while the driver and the other passenger sustained moderate to serious injuries. Both injured were immediately transported to Rashid Hospital for treatment. A recent survey carried out in the UAE showed that 40 per cent of motorists felt that roads were unsafe and have become more dangerous when compared to 2017, while almost 60 per cent said that they see in an increase in lane-swerving. Sudden swerving on lanes was the main cause of road deaths in Dubai, according to police. The survey, which was carried out by Road Safety UAE, 57 per cent of motorists said they saw an increase in since last March, while 59 per cent agreed that cases of tailgating have increased, which equals a 51 per cent increase in the last six months. “It seems that we cannot take the foot off the pedal in terms of further educating UAE motorists about safe driving," said Thomas Edelmann, Managing Director of Road Safety UAE. "On the one hand we enjoy further improved traffic infrastructure which leads to greater driving enjoyment, but on the other hand UAE motorists must realize their increasing misbehaviour and we must improve our driving manners,” he added.